Is Ocean City, NJ your favorite vacation spot and you’ve got an eye on it for your beachfront home? Are you just exploring properties in this area for the very first time but know you’d like to purchase an oceanfront property? Either way, The Pustizzi Team is excited to work with you! Beachfront homes are a Pustizzi Team specialty, so if you are looking for a Southeast view of the beloved Atlantic Ocean, you’ve come to the right place. We make sure to have all the up-to-date listings so you’ll have plenty of beautiful homes to choose from when you work with us. We have all the inside information on what makes Ocean City a top pick for beachfront homes. Beachfront properties are a great investment option as they are much more likely to hold their value than their inland counterparts. Not to mention, Ocean City NJ beachfront homes will out rent any other property type you look at. After all, aren’t you coming here to visit the beach? Therefore, if appreciation is important to you, definitely take a look at some beachfront properties. There is nothing more relaxing than seeing the ocean from right inside your home. Just in case you decide against a beachfront home, there is a wide range of Ocean City home types and prices to fit your budget. Are you looking for beachfront homes for sale in Ocean City NJ? 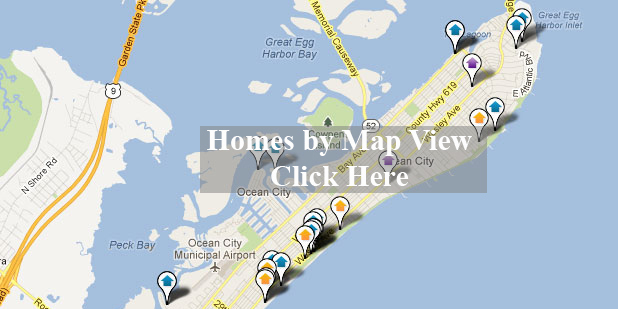 Then click on the map above to view all beachfront homes for sale. Eight miles of shoreline accompanied by a two and a half mile boardwalk make this barrier island known as Ocean City one of the largest communities to take advantage of amongst all of the Jersey Shore towns. Running from 23rd street to St. James Place, the Ocean City boardwalk is one of the most recognizable landmarks in the world. It’s also one you’ll want to position your new home close to if morning exercise and evening shopping is part of your daily routine. One of the best decisions you can make when choosing to buy a beachfront property is working with a real estate agent that is a true waterfront specialist. Beachfront living, especially in Ocean City, is bound to be relaxing, vibrant and a whole lot of fun! Agents like us with plenty of experience in beachfront property, however, can help ensure the actual home buying process is spectacular, as well. Put your mind at ease and focus on the excitement of purchasing a second home and a beachfront property. Contact the Pustizzi Team for up to date beachfront listings throughout all of the available Ocean City neighborhoods. Don’t have a specific neighborhood in mind? We have town by town information on our website, as well. Be sure to check it out! Sign up to the right to receive free daily email alerts as they hit the market.